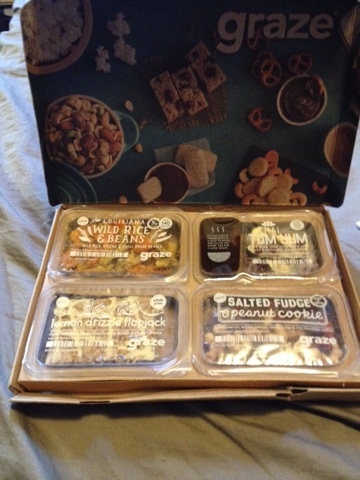 My Graze box showed up today. 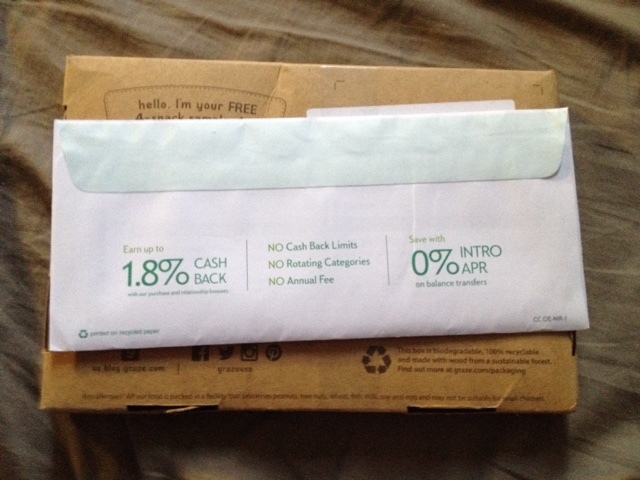 I got this through a Swagbucks deal in which I paid $1 shipping for a free trial of Graze, then earned a couple dollars' worth of Swagbucks. The concept is really more of a novelty than utilitarian. The snacks are small, definitely more of a tasting than an actual snack. I was thinking they'd be nice to take for lunch on the go or send with the kids when they don't have time for real meals between activities (like I often do with homemade muffins or energy bars I get with coupons), but they're not substantial enough even for that. The snacks list the calorie content, and most are not even 100 calories. I haven't tried the snacks yet, but they look good. They're basic enough I can't imagine they'd be bad; mostly assortments of dried fruits and nuts and things. One of the ones I was sent is a "flapjack," which is their term for something like an energy bar, only shaped closer to a square than a bar. I also got a Tom Yum dried-soup-in-a-cup-type thing, which sounds promising. So, sure, it was a fun little thing to receive, considering it was free, but overall I'm not impressed. In fact, given that the actual subscription is quite expensive, it seems downright frivolous. You can get normal portions of wholesome snacks at Trader Joe's or from Annie's or whatnot for a lot less money. Box pictured here with junk mail for scale. See? SMALL.